Did your dad ever joke about receiving a brand new 911 for Christmas out on the driveway, complete with a ton of gift wrapping and a giant bow on the hood? No? Well, it’s not unheard of to receive a type of dad joke like that, especially on Christmas morning of all days. 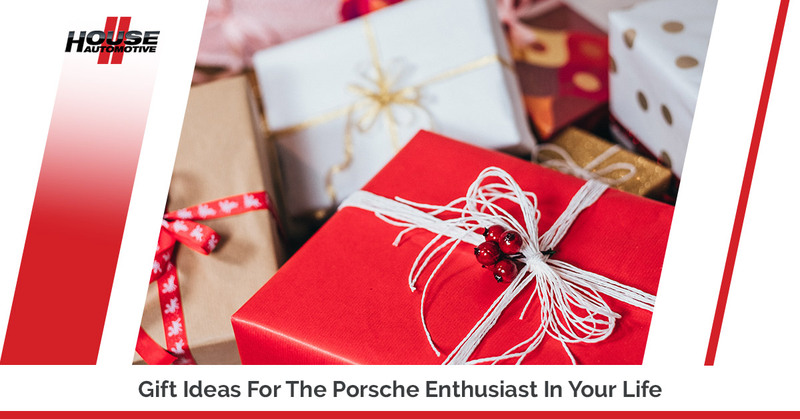 While receiving a full-on, brand new Porsche for holidays may be a bit of a “lavish” expenditure, there are ways to spread the Porsche cheer without totally breaking the bank. Whether you’re in search of a gift for your Porsche-owning friend or you read the title of this blog post and thought “I’m totally going to get one of these for myself,” we have you covered here at HOUSE Automotive. Interested in more content written by Porsche fans, for Porsche fans? You’re in the right place; check out our blog or follow us on Facebook or Instagram. Ideal for entertaining your little one or just cracking it open when you’re passing the time waiting for your vehicle to get serviced at our Porsche repair center in Pasadena, this book would surely make a great gift. Aptly titled “Porsche Sounds,” you and your loved ones can enjoy 200 expertly-designed pages of Porsche sounds, information, pictures, and in-depth stories. There are also three CDs that feature engine noises, driving music, and even “technology” noises. You’ll have to get one to find out what that means! There’s no better way of saying “I take Porsche motorsport seriously” than repping a Martini Racing beach towel. Soft, plush, and massive (for a towel), it may run you a pretty penny but it’s made with high-quality fibers — a metaphor for a Porsche, really. If your little one is expressing their interest in your favorite automotive brand, first of all, we want you to know that we’re extremely proud of them. Secondly, you should pass on the gift of driving by getting a Bluetooth-operated toy car from Amazon. This RC car takes a while to get used to because it’s controlled via your smartphone, but once you and your kiddo get the controls down, you’ll have a lot of fun honking the corn, revving the engine, and cruising it around the kitchen floor. Watch out for the dog! How could you possibly top a Steve McQueen classic like this? In terms of film, this is an essential watch for any so-called Porsche enthusiast. Even better, you can find a copy on Amazon for a White Elephant gift-friendly price of under $20 (and that’s a Blu Ray, too!). Remember, you can always gift your Porsche-loving friend credit toward our services (though we’ll admit, that’s quite the generous gift). In any case, visiting HOUSE Automotive for independent Porsche service in Pasadena is a wise move that both you and your vehicle will appreciate. We guarantee it. Don’t hesitate to prepare for winter and schedule an appointment for service today.